The Flash, Batman and Superman take on Jimmy Olsen, A.K.A. 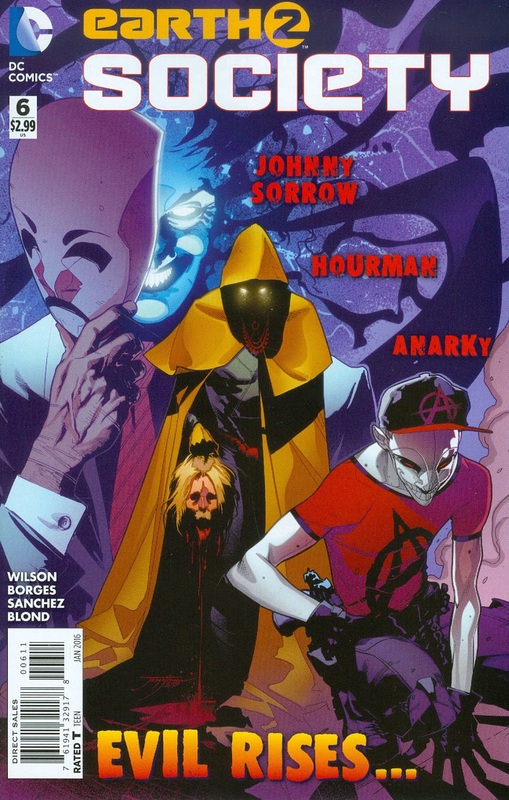 Doctor Impossible, Johnny Sorrow, Hourman and Anarky. The battle does not go well for our heroes. The Flash is blinded by Johnny Sorrow, and Superman is weakened by Kryptonite while being beaten by Hourman. Only Batman remains. Yet, the Dark Knight may have more than he bargained for as he stands alone against some of the most powerful villains he's ever faced! We now see Jimmy Olsen's life three months prior to the events in the first eight pages of this issue. He and the Huntress are trying to create a new Source Vault with no success. Tired of being perceived as a kid who wants the impossible, he feels the time to use his god-like powers has come. Thus, he names himself Doctor Impossible and recruits Rick Tyler, who has reclaimed Miraclo - a drug his father created that was locked away by Thomas Wayne. Miraclo can give the user superpowers for an hour. With Tyler as Hourman becoming one of his soldiers, Doctor Impossible moves on to the next phase of his plan, and it will have a great impact on everyone on New Earth 2. One year after planetfall, the Huntress and Power Girl are checking out New Gotham's Eden District that was changed by the Source Vault. Helena believes the rest of the planet should be transformed in the same way, but Kara thinks New Earth 2 should be left as it is. Power Girl leave the Huntress thinking her friend needs to move on after her father Bruce Wayne's death. It is at this moment that Jimmy Olsen asks Helena to join him in literally changing the world. She does so with the certainty that nobody on New Earth 2 will stop them. Is the Huntress correct? Find out next month, Superfans. Story - 4: This series has had its overall ups and downs, but things are finally picking up and going at a decent pace. I still stand by my previous reviews, and I think this arc could have easily been completed in no more than three. However, I was pleasantly surprised with this chapter. It proved to me that Earth 2: Society does have potential to be a good, fun comic. It has a long way to go before it can be as good as the Geoff Johns/Gary Frank stories from some years back. However, I am starting to have faith that it can be entertaining, especially with Dan Abnett coming on board in a couple of months. Art - 5: The style is similar to previous issues. This allows the story to flow well without the visual change being too jarring. Each panel still comes to life, and it feels like DC may be testing some of their best new artists on this title. Cover Art - 4: While the art itself deserves a five, this image feels more like an ad for action figures rather than a comic book cover. That's why I knocked a point off.